1. Someone's mental ability, intelligence, or character: The student's caliber of learning was exceptionally outstanding. 2. 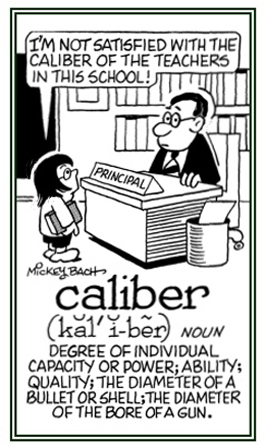 The inner diameter of a pipe or a cylinder; especially the barrel of a firearm: A caliber is the measurement of the bore of a gun; usually, expressed in hundredths or thousandths of an inch and typically written as a decimal fraction; such as, .22 or .38 caliber for the size of a bullet. 3. The external size of a projectile: The bullets that Tom used when he was target shooting were .22 calibers or approximately 0.22 of an inch or 5.6 millimeters. 4. In medicine, the broadness or size of any orifice, canal, or tube in the body: The proper caliber of a blood vessel is its diameter and so it is very important for normal blood pressure. 5. Etymology: from Greek kalapous via French calibre, "social standing or importance"; or the oldest literal meaning in English was "the inside diameter of a gun barrel, or a mold for casting bullets". © ALL rights are reserved. To determine by measurements or comparisons with a standard setup of the correct value of each scale reading on a meter or other device and with the proper value for each setting of a control knob. A descriptive term which is applied to technical measurements or comparative functions that provide more accurate results for users; as indicated in the applicable entries of this unit. The movement of an aircraft relative to the air in which it is flying as read from a differential-pressure airspeed indicator that has been corrected for instrument and installation errors: The calibrated airspeed is equal to the actual distance traveled in standard sea-level conditions. The height or elevation above sea level that is corrected for instrument and installation errors. A large metal container that has a known capacity which is used to check the accuracy of the quantity of liquid that is deliveried. 1. A reference to the verification of the accuracy of an instrument by comparing the measurements or other data which are provided with that of a valid standard which have been proven to be trustworthy. 2. Pertaining to a size of vessels or the calibers of tube-like parts. 1. The specification and measurements of the properties or performances of a device so it can be used for subsequent measuring procedures. 2. The dimensions of the size of a tube, or the determination or correction of the lines on a round structure similar to a pipe. In mapping, a line on which markers are placed at intervals which are accurately measured so they can be used for distance-measuring instruments or equipment. The numerical results which are used to determine if aerial cameras are giving the proper focal length of the camera-lens unit and the relationship of principal points of a photograph to the fixed standard marks of a camera and significant corrections for the lens distortion. A line that gives the correct value for each indicated reading of a meter or control dial. A test shooting that is intended to determine the necessary corrections for each gun or launcher of a battery to hit the intended target or targets: The calibration fire is used in order to make sure all the weapons hit the same points or that the impacts have the desired patterns. On a radar screen, the electronically generated marks that provide numerical values for the navigational parameters; such as, bearing, distance, height, and/or time. A glass negative that has been exposed with its emulsion side in the same position as that which is presented by the service emulsion at the time of exposure, providing a record of the distance between the camera's fiducial marks or references for comparisons or measurements. In ordnance dealing with weapons, the point at which synchronized firing is directed.